The ebook version of this book offers the full content of the print version at half the price. Welcome to the Student Studyspace for Discover Biology Core 5e. Effective and well-designed online resources help you succeed in your courses. StudySpace is unmatched in providing a one-stop solution that's closely aligned with your textbook. 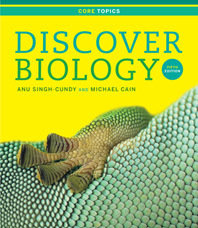 This free and easy-to-navigate website offers students an impressive range of exercises, interactive learning tools, assessment, and review materials, including: quizzes and animations--as well as links to the eBook and the SmartWork Online Homework for Discover Biology. Select a feature below to demo. SmartWork offers biology students the help they need, when they need it. Every question includes hints on how to approach the problem, and answer feedback that addresses common errors and helps students learn from their mistakes. SmartWork also links seamlessly to a complete online ebook that matches the print edition page-for-page, and offers additional multimedia resources to further encourage active learning. These detailed animations will enhance students' understanding of challenging concepts from the chapter. The animations also offer interactive activities that have been updated for this edition. Quiz+ takes online assessment to the next level. Quiz+ doesn't just tell you how you did; it shows you how you can do better. With Quiz+, you are presented with a targeted study plan that offers specific page references and links to the ebook and other online learning tools. This allows you to instantly access the resources you need, when you need them most. Biology in the News highlights relevant news stories related to biology, and offers a short quiz that will help students apply lessons from the classroom to their daily lives and the current events affecting today's scientific community. This site and the materials contained herein ©2012 W.W. Norton and Company, Inc. unless otherwise stated. All rights reserved.